…or better yet, which one will you choose to be? It may seem easier to follow the path of being a pessimist, but it’s not an easy life to live…it’s quite miserable actually. Sure, it may take a little more effort to see the “opportunity” in every difficulty, but the rewards of living that way are worth it! TRY THIS RIGHT NOW: Memorize this quote so that it can help you remember that you have TWO choices every time you find yourself in a difficult situation. Remember… Being a pessimist or an optimist is a state of mind… it doesn’t matter what’s going on around you, it only matters what’s going on inside of you! Vashni Young worked as a salesman during the lush, easy, prosperous years of the late 1920s. In October 1929 the market crashed plunging Vashni, along with a few million other people, into the bottomless economic pit of the early 1930s. He did not like the depression and had become pretty sour on this world. One day he bought a gun and decided to have a look at the next world by committing suicide. Before he pulled the trigger, he spent a little time thinking about his wife and children and decided that suicide was not a very manly way to solve a problem. And so, instead of shooting himself, he did a little analyzing and discovered that his mind had been operating like a giant junk factory, turning out all kinds of mental, emotional, and spiritual junk. It was then that he remembered William James, the great Harvard psychologist who said, “The greatest discovery of my generation is that you can change your circumstances by changing your attitudes of mind.” And while everybody wants to change his circumstances, Vash Young decided to change himself. He said: “I got tired of being a fool.” He wanted to get out of the junk business and so he dumped overboard a lot of his bad habits of liquor, tobacco, and irresponsibility. He decided to adopt some good attitudes, think like a man, be responsible, and go to work. It wasn’t long before Vash Young discovered that life was much more pleasant and that his prosperity level was going up by leaps and bounds. He wrote his great book, A Fortune to Share, and gave it as wide a circulation as possible, telling people about his discovery. Then he set aside one day each week which he called “trouble day” during which he worked with other troubled people trying to persuade them to get out of the junk business and share in this great fortune which was so readily available. He devoted his life to teaching others that our only obstacles are ourselves–we become what we think about. 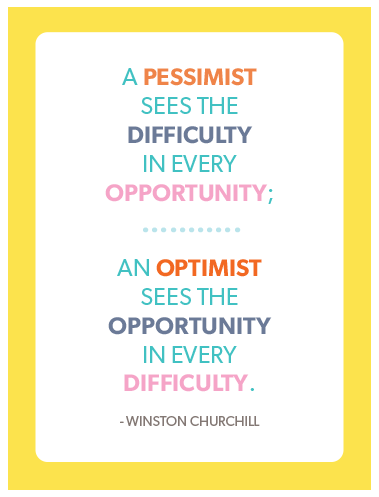 Being a pessimist or an optimist is a state of mind… it doesn’t matter what’s going on around you, it only matters what’s going on inside of you! Thanks, Crystal!!! While I haven’t been able to keep up with all the daily posts, I have been more positive (the rubber band trick helps with that!!!). Today’s is just what I needed, especially the reminder. I’m going to post that on my wall at work for sure!!! So, let me tell you of my “victory” today and you will see how your challenge is helping me!! I have been busy and somewhat lazy… dealing with a bad back and trying to move to a new house sometimes gets me overwhelmed. Well, today I sat down to read my scriptures then catch up with the last five days of the challenge. I told myself that I needed to write about each day that I missed and see what I could glean from your knowledge!! I had the feelings of being overwhelmed and not being good enough and “why can’t I just do this everyday?” and I really can’t do this challenge. “Hmmmmm…. here come the bad thoughts again”, I told myself. I stopped…. and I thought…. and I decided that this was not what you were wanting us to do, get so overwhelmed about being perfect. I decided to read through the days I missed and ponder them. Then I journaled about what struck me the most from all of them and what I was going to work on today. I know in the past I would have just given up because I couldn’t do it perfectly. I know that this challenge is really working for me!!! Thank you so much for taking the time to challenge us and do all the leg work required!! I know I am changing my thoughts, which will change my attitudes and actions, which will help myself and my family!! !